Levi ben Gerson, an Aristotelian. One thousand years after his death, Aristotle, as his pupil Alexander had aforetime done, began to conquer the East, and finally ascended to the supreme rulership of the entire realm of medieval thought. Many writings of the Stagirite were translated from their Greek originals or from their Syrian versions into Arabic (especially by the Nestorian Christian Ḥunain ibn IsḦaḳ [809-873], and his son IsḦaḳ), in which language they were eagerly studied by Jews in all Arabic-speaking countries. 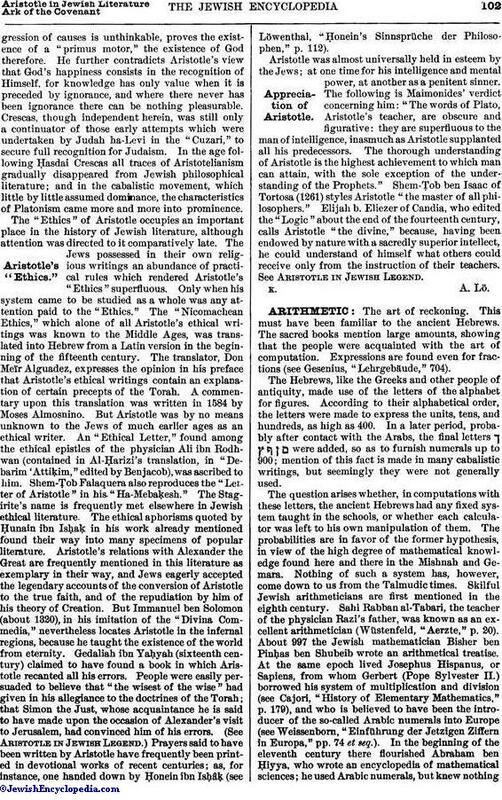 Aristotle's influence upon Jewish thinkers, however, varied in different ages. Abraham ibn Daud (1160) was the first Jewish philosopher to acknowledge the supremacy of Aristotelianism. Earlier thinkers unquestionably were acquainted with Aristotle's philosophy, but the systems of Plato and other pre-Aristotelian philosophers then held the field. From Abraham ibn Daud until long after Maimonides' time (1135-1204), Aristotelian philosophy entered and maintained the foreground, only again to yield its position gradually to Platonism, under the growing influence of the Cabala. Aristotle's name is found in the scanty details that have been handed down of the philosophy of David al-Moḳammeẓ (about 920), whom the Karaites includein their sect (see Pollak, "Halikot Ḳedem," p. 73; "Orient," 1847, pp. 620 et seq. ; and Judah Barzilai, "Yeẓirah-Commentar," ed. Berlin, pp. 65 et seq.). For Moḳammeẓ, as also for Isaac Israeli (who died about 950), Aristotle is always "the philosopher" par excellence (Steinschneider, "Hebr. Uebers." p. 391). Saadia Gaon (933) displays a minute acquaintance with the Stagirite's writings, though the name of Aristotle is not to be found in his works. But it is not his custom to mention his authorities, and he is familiar, for example, with Aristotle's definition of space and adopts it. In the third chapter of the first book of the "Emunot" he protests vehemently against the Aristotelian cosmology. He here omits the name of the Stagirite with evident intention, being unwilling to give the name of the philosopher who, claiming the existence of the world from eternity, opposes the Biblical account of Creation. In order to counteract the spreading influence of the Aristotelian theory of Creation, he is most careful to elucidate its weak points. But all these polemics do not hinder Saadia, whose philosophy is indeed of an eclectic nature, from accepting the Aristotelian definition of the soul as his own ("Emunot," iii. 5); his indebtedness to Aristotle's book, Περί Ψυχῆσ, betraying itself clearly in his Chapter on the Soul. It can be shown that Saadia does not disclose a very accurate knowledge of Aristotle in those works that precede his "Emunot," traces of Aristotelian methods appearing in his great work only. The Arab philosopher Alfarabi (died 950) popularized the Greek philosopher by his translation and commentaries, the reputation of which soon extended to Spain. The first representative of Arabian philosophy in Spain, and indeed in western countries in general, was not an Arab, but a Jew, Solomon ibn Gabirol. His "Meḳor Ḥayyim" shows a consistent amalgamation of Aristotelian principles with Neo-Platonic conceptions of the universe. But in spite of the unmistakable traces of Aristotelian philosophy in the "Meḳor Ḥayyim," the Greek's name is not mentioned. Aristotle is mentioned, however, in Gabirol's "Tiḳḳun Middot ha-Nefesh." When the Stagirite's scientific works were prepared for Western readers, it was held necessary to popularize them. There is a work, written in Arabic, containing many moral maxims collected from Greek philosophers. This book, "The Dicta of the Philosophers," by the above-mentioned translator, Ḥunain ibn IsḦaḳ, afforded those to whom the study of exact philosophy was too difficult the possibility of familiarizing themselves with the best thoughts of the Greek philosophers, and it thus contributed much to Aristotle's popularity in Jewish circles. (Concerning this work and its influence upon literature, see Löwenthal, "Ḥonein ibn IsḦâḳ's 'Sinnsprüche der Philosophen,'" Berlin, 1896.) Unquestionably, it was from this book that Gabirol took the aphorisms that are quoted in the "Tiḳḳun" as by Aristotle. In the Tiḳḳun also, without mention of the author, are found several passages on the Aristotelian doctrine of the "ethical mean." In the period following Gabirol, the writings of Avicenna, a commentator upon Aristotle, became widely known throughout Europe, leading to the displacement of the older philosophy based upon Plato and Neo-Platonism. The Arabic expounders of Aristotle leavened his views more and more with monotheism; and thus through new interpretations and constructions the heathen character of his philosophy was gradually refined away. Then, too, many works passed under Aristotle's name that a more critical age would immediately have detected as spurious. 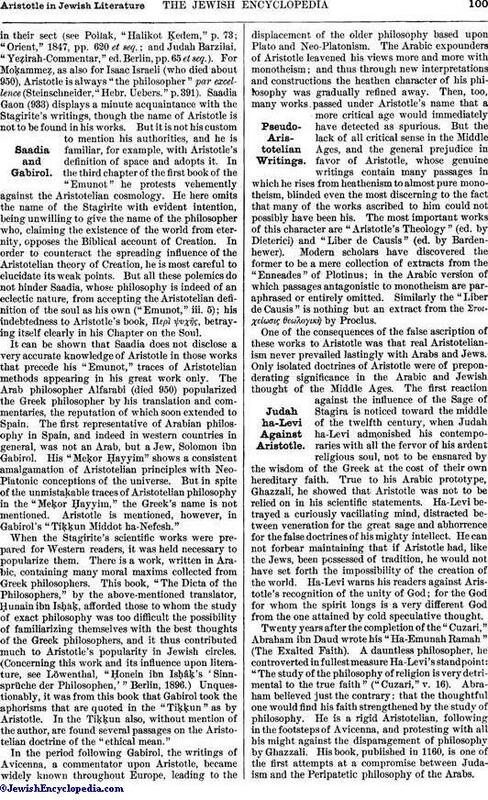 But the lack of all critical sense in the Middle Ages, and the general prejudice in favor of Aristotle, whose genuine writings contain many passages in which he rises from heathenism to almost pure monotheism, blinded even the most discerning to the fact that many of the works ascribed to him could not possibly have been his. The most important works of this character are "Aristotle's Theology" (ed. by Dieterici) and "Liber de Causis" (ed. by Bardenhewer). Modern scholars have discovered the former to be a mere collection of extracts from the "Enneades" of Plotinus; in the Arabic version of which passages antagonistic to monotheism are paraphrased or entirely omitted. Similarly the "Liber de Causis" is nothing but an extract from the Στοιχείωσίς θεωλογικη by Proclus. One of the consequences of the false ascription of these works to Aristotle was that real Aristotelianism never prevailed lastingly with Arabs and Jews. Only isolated doctrines of Aristotle were of preponderating significance in the Arabic and Jewish thought of the Middle Ages. The first reaction against the influence of the Sage of Stagira is noticed toward the middle of the twelfth century, when Judah ha-Levi admonished his contemporaries with all the fervor of his ardent religious soul, not to be ensnared by the wisdom of the Greek at the cost of their own hereditary faith. True to his Arabic prototype, Ghazzali, he showed that Aristotle was not to be relied on in his scientific statements. Ha-Levi betrayed a curiously vacillating mind, distracted between veneration for the great sage and abhorrence for the false doctrines of his mighty intellect. He can not forbear maintaining that if Aristotle had, like the Jews, been possessed of tradition, he would not have set forth the impossibility of the creation of the world. 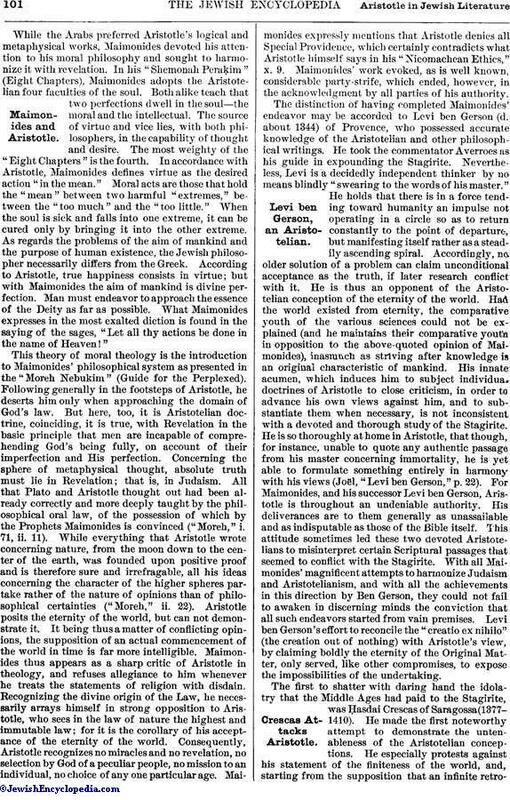 Ha-Levi warns his readers against Aristotle's recognition of the unity of God; for the God for whom the spirit longs is a very different God from the one attained by cold speculative thought. Twenty years after the completion of the "Cuzari," Abraham ibn Daud wrote his "Ha-Emunah Ramah" (The Exalted Faith). A dauntless philosopher, he controverted in fullest measure Ha-Levi's standpoint: "The study of the philosophy of religion is very detrimental to the true faith" ("Cuzari," v. 16). Abraham believed just the contrary: that the thoughtful one would find his faith strengthened by the study of philosophy. He is a rigid Aristotelian, following in the footsteps of Avicenna, and protesting with all his might against the disparagement of philosophy by Ghazzali. His book, published in 1160, is one of the first attempts at a compromise between Judaism and the Peripatetic philosophy of the Arabs. While the Arabs preferred Aristotle's logical and metaphysical works, Maimonides devoted his attention to his moral philosophy and sought to harmonize it with revelation. In his "Shemonah Peraḳim" (Eight Chapters), Maimonides adopts the Aristotelian four faculties of the soul. Both alike teach that two perfections dwell in the soul—the moral and the intellectual. The source of virtue and vice lies, with both philosophers, in the capability of thought and desire. The most weighty of the "Eight Chapters" is the fourth. In accordance with Aristotle, Maimonides defines virtue as the desired action "in the mean." Moral acts are those that hold the "mean" between two harmful "extremes," between the "too much" and the "too little." When the soul is sick and falls into one extreme, it can be cured only by bringing it into the other extreme. As regards the problems of the aim of mankind and the purpose of human existence, the Jewish philosopher necessarily differs from the Greek. According to Aristotle, true happiness consists in virtue; but with Maimonides the aim of mankind is divine perfection. Man must endeavor to approach the essence of the Deity as far as possible. What Maimonides expresses in the most exalted diction is found in the saying of the sages, "Let all thy actions be done in the name of Heaven!" This theory of moral theology is the introduction to Maimonides' philosophical system as presented in the "Moreh Nebukim" (Guide for the Perplexed). Following generally in the footsteps of Aristotle, he deserts him only when approaching the domain of God's law. But here, too, it is Aristotelian doctrine, coinciding, it is true, with Revelation in the basic principle that men are incapable of comprehending God's being fully, on account of their imperfection and His perfection. Concerning the sphere of metaphysical thought, absolute truth must lie in Revelation; that is, in Judaism. All that Plato and Aristotle thought out had been already correctly and more deeply taught by the philosophical oral law, of the possession of which by the Prophets Maimonides is convinced ("Moreh," i. 71, ii. 11). While everything that Aristotle wrote concerning nature, from the moon down to the center of the earth, was founded upon positive proof and is therefore sure and irrefragable, all his ideas concerning the character of the higher spheres partake rather of the nature of opinions than of philosophical certainties ("Moreh," ii. 22). Aristotle posits the eternity of the world, but can not demonstrate it. It being thus a matter of conflicting opinions, the supposition of an actual commencement of the world in time is far more intelligible. Maimonides thus appears as a sharp critic of Aristotle in theology, and refuses allegiance to him whenever he treats the statements of religion with disdain. Recognizing the divine origin of the Law, he necessarily arrays himself in strong opposition to Aristotle, who sees in the law of nature the highest and immutable law; for it is the corollary of his acceptance of the eternity of the world. Consequently, Aristotle recognizes no miracles and no revelation, no selection by God of a peculiar people, no mission to an individual, no choice of any one particular age. Maimonides expressly mentions that Aristotle denies all Special Providence, which certainly contradicts what Aristotle himself says in his "Nicomachean Ethics," x. 9. Maimonides' work evoked, as is well known, considerable party-strife, which ended, however, in the acknowledgment by all parties of his authority. The distinction of having completed Maimonides' endeavor may be accorded to Levi ben Gerson (d. about 1344) of Provence, who possessed accurate knowledge of the Aristotelian and other philosophical writings. He took the commentator Averroes as his guide in expounding the Stagirite. Nevertheless, Levi is a decidedly independent thinker by no means blindly "swearing to the words of his master." He holds that there is in a force tending toward humanity an impulse not operating in a circle so as to return constantly to the point of departure, but manifesting itself rather as a steadily ascending spiral. Accordingly, no older solution of a problem can claim unconditional acceptance as the truth, if later research conflict with it. He is thus an opponent of the Aristotelian conception of the eternity of the world. Had the world existed from eternity, the comparative youth of the various sciences could not be explained (and he maintains their comparative youth in opposition to the above-quoted opinion of Maimonides), inasmuch as striving after knowledge is an original characteristic of mankind. His innate acumen, which induces him to subject individual doctrines of Aristotle to close criticism, in order to advance his own views against him, and to substantiate them when necessary, is not inconsistent with a devoted and thorough study of the Stagirite. He is so thoroughly at home in Aristotle, that though, for instance, unable to quote any authentic passage from his master concerning immortality, he is yet able to formulate something entirely in harmony with his views (Joël, "Levi ben Gerson," p. 22). For Maimonides, and his successor Levi ben Gerson, Aristotle is throughout an undeniable authority. His deliverances are to them generally as unassailable and as indisputable as those of the Bible itself. This attitude sometimes led these two devoted Aristotelians to misinterpret certain Scriptural passages that seemed to conflict with the Stagirite. With all Maimonides' magnificent attempts to harmonize Judaism and Aristotelianism, and with all the achievements in this direction by Ben Gerson, they could not fail to awaken in discerning minds the conviction that all such endeavors started from vain premises. Levi ben Gerson's effort to reconcile the "creatio ex nihilo" (the creation out of nothing) with Aristotle's view, by claiming boldly the eternity of the Original Matter, only served, like other compromises, to expose the impossibilities of the undertaking. The first to shatter with daring hand the idolatry that the Middle Ages had paid to the Stagirite, was Ḥasdai Crescas of Saragossa(1377-1410). He made the first noteworthy attempt to demonstrate the untenableness of the Aristotelian conceptions. He especially protests against his statement of the finiteness of the world, and, starting from the supposition that an infinite retrogressionof causes is unthinkable, proves the existence of a "primus motor," the existence of God therefore. He further contradicts Aristotle's view that God's happiness consists in the recognition of Himself, for knowledge has only value when it is preceded by ignorance, and where there never has been ignorance there can be nothing pleasurable. Crescas, though independent herein, was still only a continuator of those early attempts which were undertaken by Judah ha-Levi in the "Cuzari," to secure full recognition for Judaism. In the age following Ḥasdai Crescas all traces of Aristotelianism gradually disappeared from Jewish philosophical literature; and in the cabalistic movement, which little by little assumed dominance, the characteristics of Platonism came more and more into prominence. 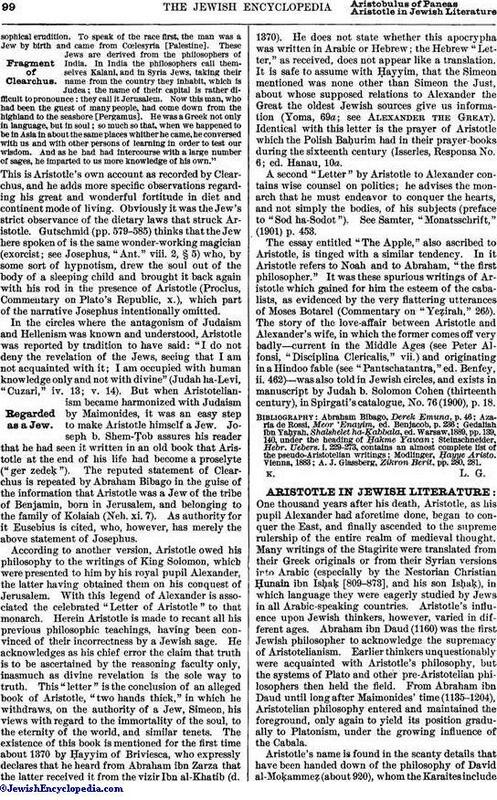 The "Ethics" of Aristotle occupies an important place in the history of Jewish literature, although attention was directed to it comparatively late. The Jews possessed in their own religious writings an abundance of practical rules which rendered Aristotle's "Ethics" superfluous. Only when his system came to be studied as a whole was any attention paid to the "Ethics." The "Nicomachean Ethics," which alone of all Aristotle's ethical writings was known to the Middle Ages, was translated into Hebrew from a Latin version in the beginning of the fifteenth century. The translator, Don Meïr Alguadez, expresses the opinion in his preface that Aristotle's ethical writings contain an explanation of certain precepts of the Torah. A commentary upon this translation was written in 1584 by Moses Almosnino. But Aristotle was by no means unknown to the Jews of much earlier ages as an ethical writer. An "Ethical Letter," found among the ethical epistles of the physician Ali ibn Rodhwan (contained in Al-Ḥarizi's translation, in "Debarim 'Attiḳim," edited by Benjacob), was ascribed to him. Shem-Ṭob Falaquera also reproduces the "Letter of Aristotle" in his "Ha-Mebaḳesh." The Stagirite's name is frequently met elsewhere in Jewish ethical literature. The ethical aphorisms quoted by Ḥunain ibn IsḦaḳ in his work already mentioned found their way into many specimens of popular literature. Aristotle's relations with Alexander the Great are frequently mentioned in this literature as exemplary in their way, and Jews eagerly accepted the legendary accounts of the conversion of Aristotle to the true faith, and of the repudiation by him of his theory of Creation. But Immanuel ben Solomon (about 1320), in his imitation of the "Divina Commedia," nevertheless locates Aristotle in the infernal regions, because he taught the existence of the world from eternity. Gedaliah ibn YaḦyah (sixteenth century) claimed to have found a book in which Aristotle recanted all his errors. People were easily persuaded to believe that "the wisest of the wise" had given in his allegiance to the doctrines of the Torah; that Simon the Just, whose acquaintance he is said to have made upon the occasion of Alexander's visit to Jerusalem, had convinced him of his errors. (See Aristotle in Jewish Legend.) Prayers said to have been written by Aristotle have frequently been printed in devotional works of recent centuries; as, for instance, one handed down by Ḥonein ibn IsḦâḳ (see Löwenthal, "Ḥonein's Sinnsprüche der Philosophen," p. 112). Aristotle was almost universally held in esteem by the Jews; at one time for his intelligence and mental power, at another as a penitent sinner. The following is Maimonides' verdict concerning him: "The words of Plato, Aristotle's teacher, are obscure and figurative: they are superfluous to the man of intelligence, inasmuch as Aristotle supplanted all his predecessors. The thorough understanding of Aristotle is the highest achievement to which man can attain, with the sole exception of the understanding of the Prophets." Shem-Ṭob ben Isaac of Tortosa (1261) styles Aristotle "the master of all philosophers." Elijah b. Eliezer of Candia, who edited the "Logic" about the end of the fourteenth century, calls Aristotle "the divine," because, having been endowed by nature with a sacredly superior intellect, he could understand of himself what others could receive only from the instruction of their teachers. See Aristotle in Jewish Legend.